We first got to experience the 3Doodler back in January at CES 2014. At IFA the company behind the world’s first 3D Printing Pen had some great news to share with the world. 3Doodler now has over 100,000 users. 3D writing has taken off. The pen, which retailed globally this year, allows people to 3D design incredible doodles, limited only by their own imagination. In addition to the announcement that 3Doodler has sold over 100,000 units they’ve also announced some new 3Doodler accessories that were the results of direct user/customer feedback. 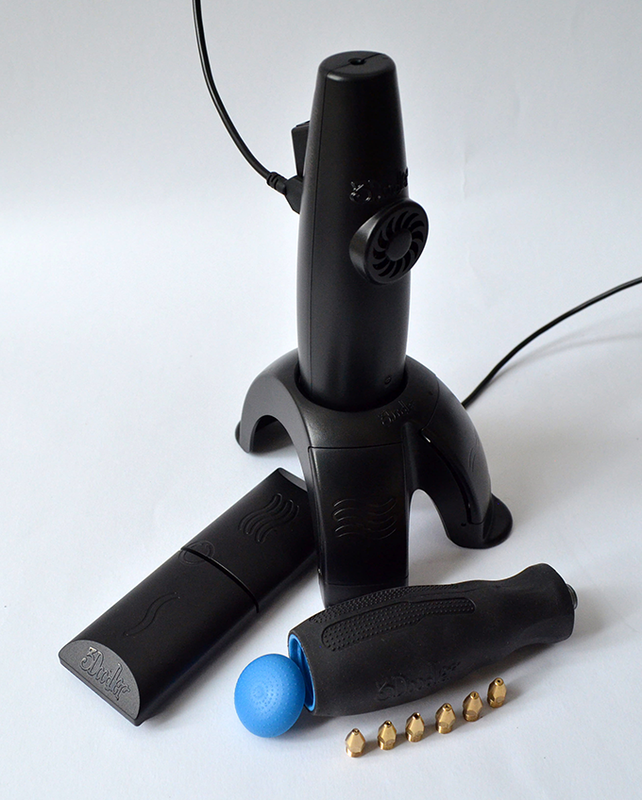 The new accessories were released at IFA 2014 and included the DoodleStand, Nozzle Set, and the 3Doodler “Pedal”. The DoodleStand not only elegantly holds the 3Doodler but also moves, helping users doodle accurate and clean lines – especially useful for those with unsteady hands. The Nozzle Set is a series of six interchangeable nozzles including ribbon-shaped, square and triangular nozzles, which allow users to extrude plastic in completely new shapes and sizes – the set even includes a handy tool for removing and storing your nozzles. The Pedal, revealed for the first time at IFA, is a foot pedal that you control to stop and start the extrusion of plastic. This means you can hold the pen from various angles to create and doodle without the restriction of holding the buttons near the tip, making 3D design easier than ever before. Having shipped more than 100,000 pens in the past 11 months, 3Doodler is now the world’s most popular 3D printing device. 3Doodler took the 3D printing world by storm after launching in 2013 as the world’s first 3D pen, and has now far surpassed the number of units sold by any other brand in the 3D printing space. Key to the 3Doodler’s success is how compact and easy it is to use. The pen allows you to literally draw in the air – whether freestyle 3D sketching or tracing shapes from templates to make larger architectural structures; the 3Doodler allows designers, geometrists, hobbyists, teachers, and architects to test out their ideas quickly and easily. 3Doodler now boasts one of the largest and most extensive ranges of plastics for any 3D printing related store, with a total of 50 colors across ABS and PLA. The introduction of the new range of twelve colors – including Radioactive Yellow, Cotton Candy Pink, Café au Lait, and six additions to the “Clearly” range, Clearly Clementine and Clearly Cherry – is based on the company’s research and analysis of plastics purchasing behavior and user preferences to date. “We’re very excited to be showing off our new accessories and plastics at IFA, after successfully shipping units globally and retailing in stores around the world.” said Daniel Cowen, Co-Founder. “The simplicity of 3Doodler has sparked imaginations. Just a few of the things that have been 3D designed include a 6ft scale model of the Tokyo Tower, the first ever life sized 3D printed humanoid skeleton, fashion designs, including a fully 3Doodled dress, a Stephen Colbert “truthiness” monument, and a working RC plane. That more than a hundred thousand people are using our 3D pen worldwide marks a fantastic year for both 3Doodler and the 3D printing industry alike; and by giving people new accessories and plastics to use with the 3Doodler, we hope to continue sparking imaginations and encouraging people to doodle truly fantastic creations”.